The Cinqueterre are a series of five tiny but absolutely stunning coastal villages located about 100 km east of Genoa and therefore about 300km east of Nice: from west to east, they are Monterosso al Mare, Vernazza, Corniglia, Manarola and Riomaggiore. 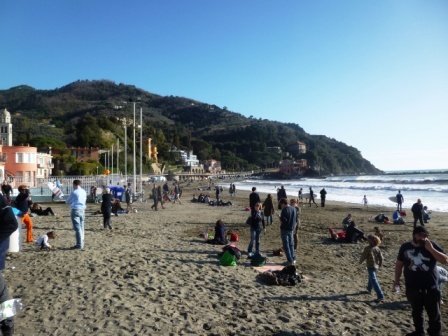 They are therefore located on the Levanto Riviera just before the large naval base of La Spezia, the same part of coastline that houses such famous resorts as Portofino, Rapallo, Santa Margherita Ligure, Sestri Levante and Portovenere. The Levanto Riviera east of Genoa is rather similar to the portion of the French Riviera east of Nice, in that it is surrounded by huge cliffs and mountains that drop straight into the rocky sea, making it very tough to settle on the coastline. The five villages are located in coves along the coastline, making them isolated for centuries (only accessible via mule paths or by sea) and enabling them to cultivate their individualism, which gives them so much charm nowadays, as each village has its own particular character. The villages lived off fishing, olive oil culture and wine for centuries until they were attached to the Republic of Genoa. Nowadays, they mainly live off the tourism industry, even though the region still remains rather isolated compared to the rest of Italy and the French Riviera and any minor glitches in the transport system will quickly remind you of what a pain life was for the villagers up until a few decades ago. 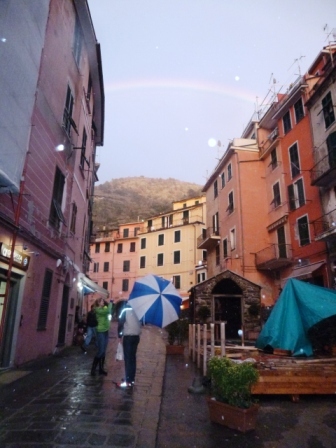 There was also a sharp reminder of this on 25 October 2011, when some torrential rainstorms caused a huge mudslide that devastated the Cinqueterre and the surrounding area, killing several villagers and destroying a considerable number of businesses, especially the restaurants. The inhabitants were extremely resilient in rebuilding the area for the next tourist season but the damage is still present and when I visited 18 months later, several main attractions had still not reopened like the coastal path between the villages, a reminder of how dependent the area is on nature. Here’s how I planned my trip, it was a great and very efficient way to see as much as possible in a limited time but was pretty exhausting, especially Day 2: use the detailed information provided afterwards to define your stay according to your own interests. 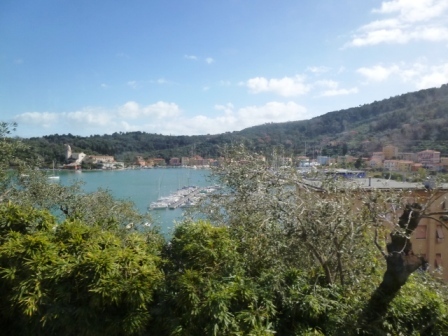 – Return to Monaco with lunch break and walk around Sestri Levante, a charming seaside resort between the Cinqueterre and Portofino. Lunch at Osteria Mattana. 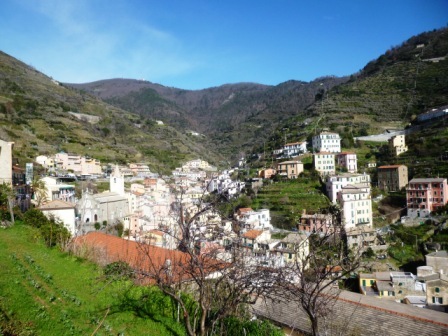 This is the first village that you will encounter when arriving from the west (Genoa or the French Riviera) – Monterosso is the closest to being a normal village, ie. not the prettiest of the five, but the most accessible and also probably the one with the most going on, along with Riomaggiore, giving it more of a resort feel. 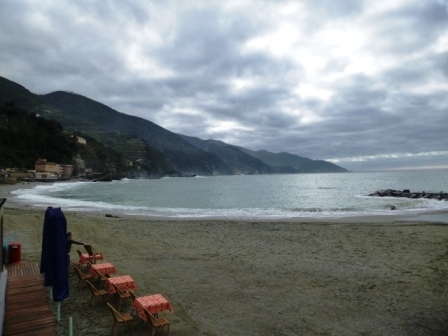 This is the reason why I chose Monterosso as a base during my two-night stay. The village is divided into two distinct sections – Fegina to the west, which houses most of the hotels and the railway station, and the central old village further east, which is a bit more traditional. Both areas are separated by a short pedestrian tunnel, but it is impossible to get from A to B by taxi without having to use some very tight mountain roads passing through the back. 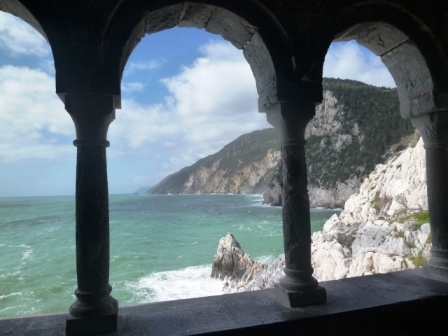 Fegina boasts a lovely seaside promenade, ideal for the afternoon passeggiata enjoyed by most Italians with spectacular views looking west towards the imposing Punta Mesco cliff and eastwards along the coast towards the four other villages and the Portovenere promonotory. This view was particularly spectacular when I arrived at the end of a rainy day, after the brunt of the storm but before the rainclouds had cleared up over the mountains. 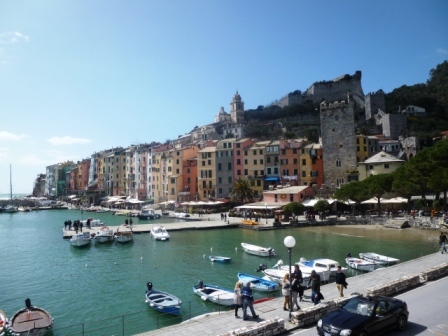 Walk past the train station and through the pedestrian tunnel beneath the Capucine monastery to reach the harbour and the older part of the village, complete with an old castle and some typical Ligurian old town streets full of excellent bars and restaurants. There isn’t really a huge amount to see but I found it very pleasant to just stroll around the small streets, especially at night whilst enjoying the peace and quiet of the village after dinner – also, contrary to some of the other villages, Monterosso is large enough to be able to spend a few hours in without getting too bored. 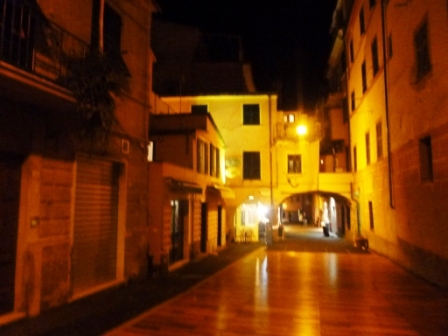 Explore the old village of Monterosso by night, fabulous atmosphere! Vernazza is widely considered to be the most beautiful of the 5 villages and it’s easy to figure out why, just by looking at its setting. 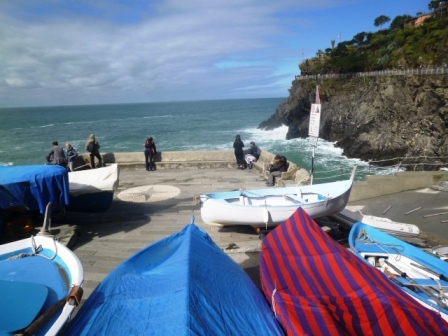 The village is located in a tiny cove in the only natural harbour of the Cinqueterre, set around Piazza Marconi, full of colourful fishing boats in the dry dock when they are not out at sea. The downside however is that the place is pretty tiny so there isn’t a huge amount to do other than visiting the beautiful Santa Margarita d’Antochia church which has a distinctive maritime feel and an octagonal bell tower, wandering round the harbour and up and down the main street. When I visited, my train back to Monterosso was delayed in a typically opaque Italian manner (first the monitor showed a 10 minute delay, then 20, then 45, then 60, then about 2 hours later it arrived), so I visited several bars for the aperitivo whilst waiting, that was pretty much all there was to do there, in addition of course to admiring the beautiful sunset over Punta Mesco, so it wasn’t all that bad! The best of the three bars I visited was the one located directly on the harbour, just by the church: you can’t miss it, it’s the busiest one, they mixed a great Negroni and also had a nice aperitivo buffet which was great as I was getting a bit peckish by then! Something I didn’t have the opportunity to do was to wander up the hill behind the church, from which you can apparently get a stunning picture postcard view of the village. 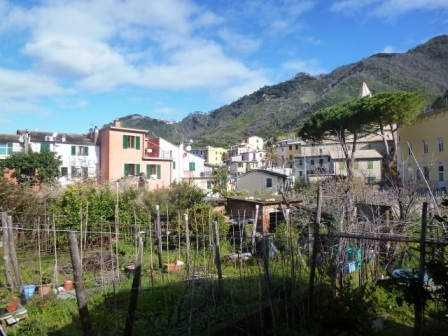 Corniglia, village number 3, is somewhat overlooked by most visitors as it is perched on top of a promontory about 100m above sea level and therefore doesn’t have any direct access to the coast, thereby giving it more of an agricultural than a maritime feel. My word of advice is to check it out anyway, it’s well worth it. It is this strange location that makes the village stand out and provides its particular atmosphere – there isn’t a huge amount to see up there but just wander around the ancient streets (which remind me of some of the Val Nervia villages described in one my other articles) and discover some amazing viewpoints. 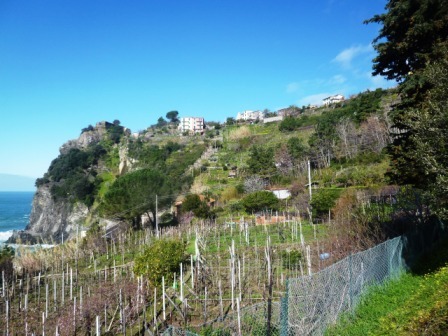 Make sure that you visit the Santa Maria belvedere, which affords stunning views over the Cinqueterre coastline and the railway station below – just this view makes the whole visit worthwhile. There are also a few welcoming streets with souvenir shops and nice-looking cafés where you can stop over for a cappuccino before heading over to the next village. 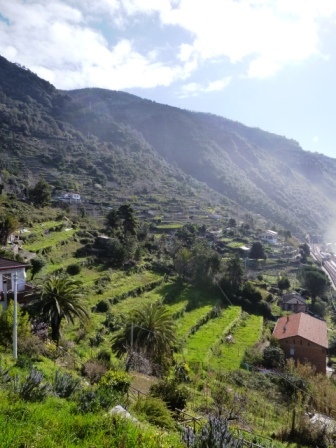 – Shuttle bus (recommended): if you have the Cinqueterre railway pass, it’s free and will whisk you up to the village in about five minutes, the bus times generally follow the train arrivals, which is pretty logical. 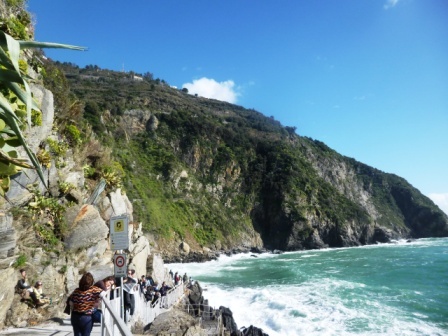 Full timetables are available on the second page of the PDF document in this link: http://www.atcesercizio.it/cinqueterre.pdf . 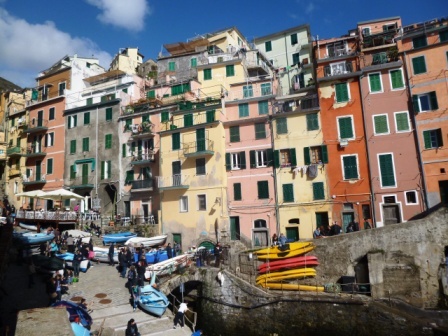 If for some reason you don’t have a Cinqueterre card (and there’s no reason not to! ), it will cost a small amount per person, I think around 2€. – Walk up via the steps that head up from the west of the train station towards the village. There are 382 steps in total so don’t be silly – unless you are fitness freaks, just take the bus, especially as it can get pretty hot on those steps and you’ll need your energy to visit the rest of the villages especially if time is limited. The steps are so notorious that they even have a name, the Lardarina! 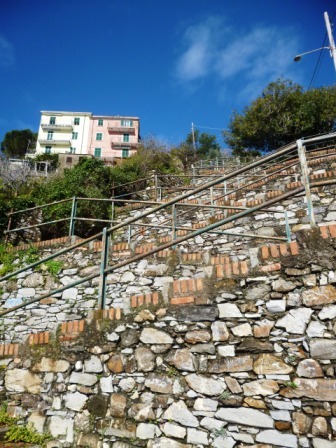 The very long staircase leading up to the village of Corniglia – just take the bus up and walk down! – Walk up via the winding road that loops up from the railway station through the vineyards and olive groves, to the village: it will take around 20-30 minutes and is less steep than the steps, but be careful as there’s no pavement and the local drivers tend to drive pretty quickly on the mountain roads. What I advise is to take the shuttle bus up and then walk down the steps, that way you’ll enjoy some amazing views over the beach which is located just underneath the railway station. The fourth village of Manarola has plenty of charm thanks to its tiny harbour surrounded by a very colourful mound of typical houses, all stuck together like a 3 dimensional jigsaw puzzle (or a bunch of Jenga blocks combined with a Rubik’s cube if you prefer). Once you get out of the train station, unlike Corniglia, you just have to walk through a short tunnel to be in the heart of the village. Sizewise, Manarola is pretty similar to Vernazza and is tiny so it’s easy to wander around the place pretty quickly – all the tourists tend to hog the main street (full of seafood restaurants) between the railway station and the tiny harbour which has nice views with its colourful fishing boats, but walk a bit further along the bottom of the cliff to the right (when facing the sea) to get some lovely views over the colourful houses of the village to the east and over the three other villages and Punta Mesco to the west. The downside of the village is that it gets packed very quickly, but the tourist groups (who arrive in waves depending on the trains) tend to wander around the streets in herds before taking the next train – the trick is to follow a loop through the streets in the opposite direction from the groups, so that you are never in the same place as them. This applies to all the villages, but especially Manarola and Vernazza which are both accessible to groups but very small so prone to overcrowding. 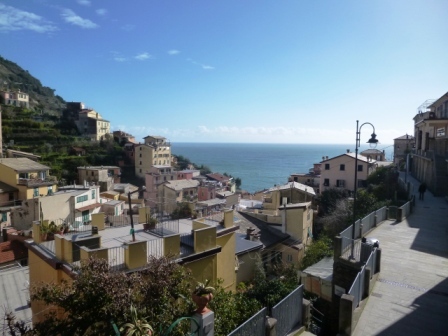 Normally to cover the short distance to the final village of Riomaggiore there is the very well-trodden and therefore well-maintained footpath starting from Manarola railway station, called the Via dell’Amore. 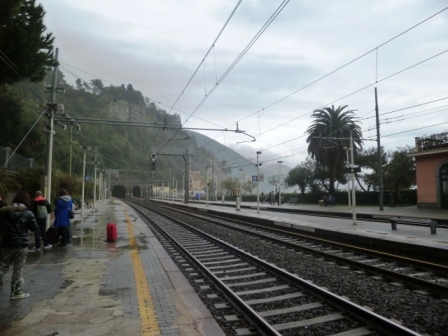 However, at the time of writing, it is still closed, so you’ll need to take the train for the moment – see the section about getting around the Cinqueterre for more information. 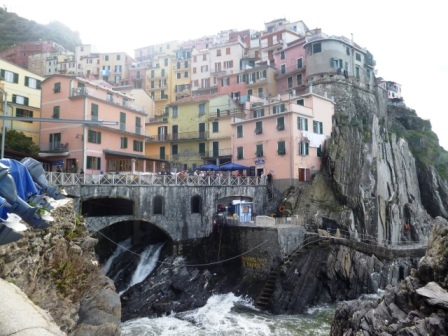 Riomaggiore is the final Cinqueterre village you will encounter before hitting “civilisation” (ie. 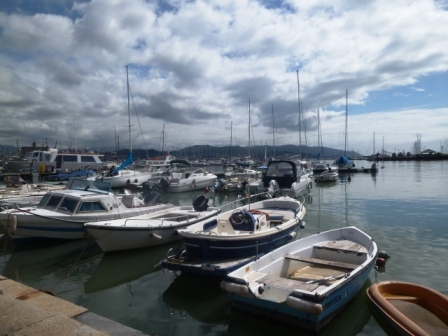 grottiness) again in la Spezia – it is the largest of the five villages and, due to its proximity to La Spezia, is the de facto capital. At the same time, it is probably the one that exudes the most character (much more in any case than the other “large” village, Monterosso) due to a spectacular setting inside another cove. 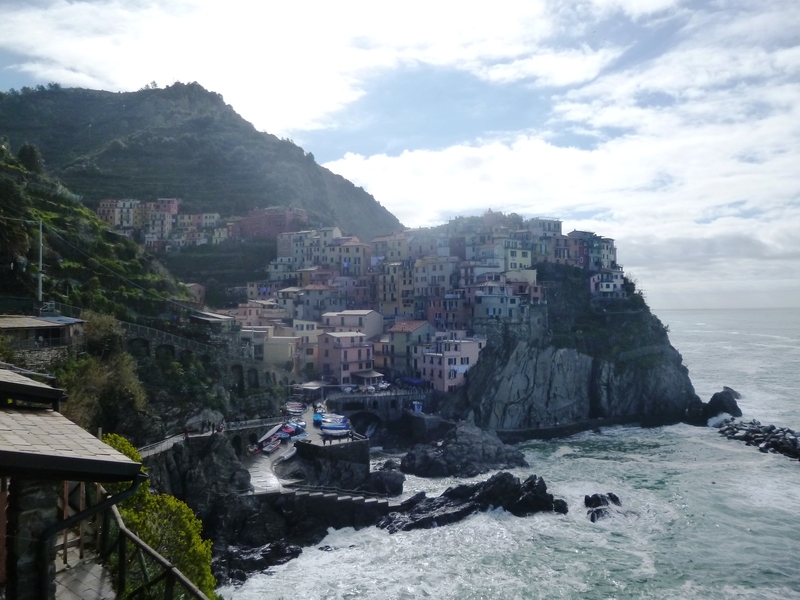 To get an idea, just imagine a much larger version of Manarola. There’s the obligatory main street (Via Columbo) leading from the railway station down to the tiny harbour battered by the waves, but there’s plenty more to explore inside the tiny alleyways of the village so I’d just advise you to wander around and “get lost”. 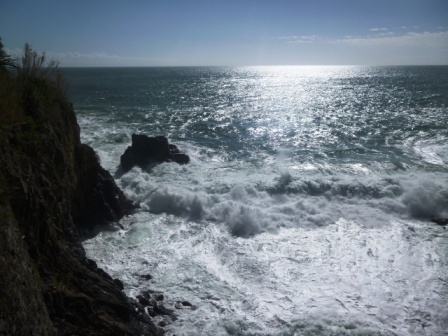 Those feeling adventurous can follow the small path across the cliffs to the east for a few hundred metres and admire some beautiful sea views and just sunbathe on the rocks. Or else, if you are feeling a bit more energetic (like I did on the day of my visit, thanks to a very nice lunch in Portovenere with a delicious Vermentino white wine and a few strong espressos! ), you can even head up the hill through the houses on the western part of the cove up to the castle where you will see yet more sumptuous coastline views. The main thing you’ll notice is that, unlike the French Riviera, there’s no coastal road so it’s impossible to just drive from one village to another, simply because the coast is so abrupt, which explains how isolated the villages were for hundreds of years, and still are, relatively speaking. The only road between the villages passes high above the villages in the mountains. Parking in the villages themselves is also a nightmare with only a few small car parks which are quickly saturated in the high season. 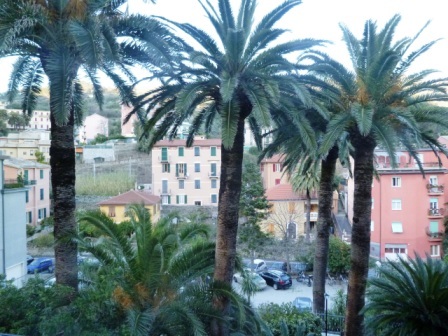 So if you don’t have a hotel with a car park, I’d advise to leave your car either in Levanto or La Spezia and then just to take the train everywhere. 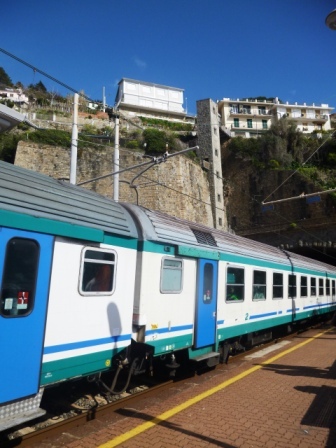 By far the easiest way to get around is the regular train line that links Genoa and La Spezia and conveniently passes through the 5 Cinqueterre villages: all trains stop at least in Riomaggiore and Monterosso, the non-express ones also stop in Manarola, Corniglia and Vernazza. 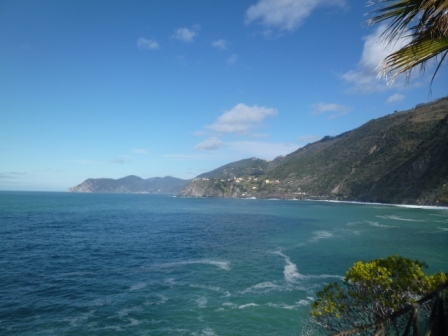 I strongly recommend the Cinqueterre (Treno) pass, which gives access to various sites, hiking paths as well as unlimited train travel between La Spezia and Levanto, plus obviously the five villages in between, for one or two days for 12€ or 23€ respectively. Not that cheap, but worth it given that you will want to waste as little time as possible. You can find all the necessary practical information on this website, as well as the train timetables. I would definitely recommend that you take a few minutes to study the train timetables at the start of your day to optimise your visit. If you have a bit more energy, there are some amazing trails that wind around the National Park: first of all, a coastal path (Sentiere no. 2) that runs between Riomaggiore and Monterosso affording spectacular views over the coastline: the first part between Riomaggiore and Manarola, known as the “Via dell’Amore” (the Pathway of Love), the section that most tourists walk down, the flattest and is as cheesy as the name suggests so can get pretty packed with tour groups admiring the rather tacky concrete sculptures of loving couples. The other sections further to the west are much tougher and rugged with better views but involving lots of uphill and downhill walking, so you need decent hiking boots. As there is hardly any shade on the coastal paths, you’ll also need plenty of water and sun cream in the summer. There are also several paths running inland between the villages, known as the “Sentieri degli Santuari” after the medieval sanctuaries built above each village as refuges in the event of invasions, notably from the Saracens. I didn’t have the opportunity to try these out but the reviews are fabulous – again, be prepared for plenty of uphill and downhill trekking so don’t bother if you cannot walk much. 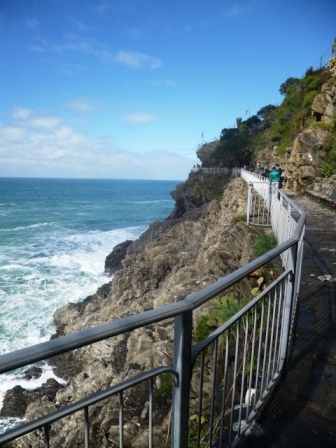 An important note is that several of these paths, notably parts of the coastal paths, are often closed for repairs or due to adverse weather conditions or landslides. For the latest news, check the National Park website which will tell you exactly which paths are open when. 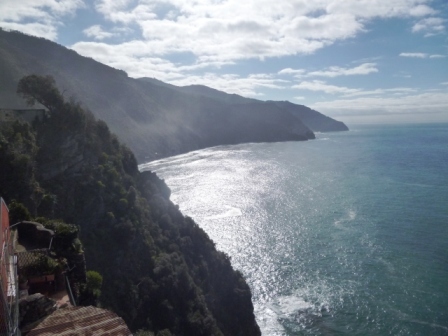 There is also an entrance fee to access the paths in the National Park (5 euros for a day pass), but if you have the Cinqueterre train pass as strongly advised, you can access them for free. Another fun option is to visit the Cinqueterre by boat: there are regular services weaving their way between the 5 villages and nearby Portovenere, La Spezia and Lerici. This option is a little more time-consuming (routes are less frequent) and expensive than the train (between 15€ and 27€ depending on whether you take a single trip or a day pass) but if you have a bit more time to spare then I’d definitely advise it as seeing the villages from the sea is pretty magical, and was the primary means of transport for the villagers up until the 20th century, though obviously not with the same type of boat. Boat routes only run from the end of March until October and can be cancelled whenever the sea is rough, which can happen more often than you would expect, here’s the website of one of the shuttle operators. In addition to the five villages, you can take the opportunity of a long weekend to visit several of the other interesting towns nearby. 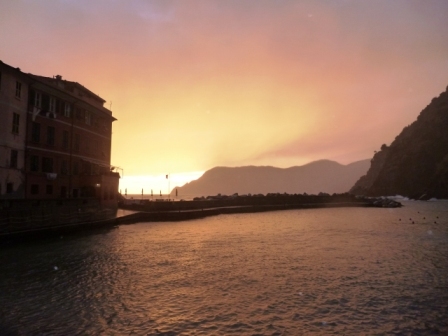 This is the large naval city located just to the east of Riomaggiore, so is the transport hub of eastern Liguria. Its major asset is its beautiful and strategic location inside the Gulf of Poets I stopped over there because the guide books said that despite its ugly rough harbour town exterior, the city had plenty of hidden charm (especially due to some nice museums and art galleries): unfortunately I saw plenty of the former but none of the latter, so can’t really advise you to spend a lot of time there, though it was Easter Sunday so was pretty dead and coming straight from charming Manarola, it was rather disappointing. 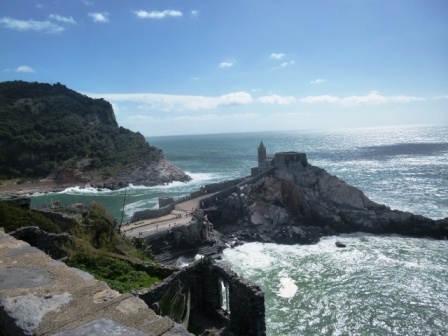 One issue is that the train station is a rather boring 15-minute walk to the town centre, but you do need to go to the waterfront to take the bus to Portovenere. 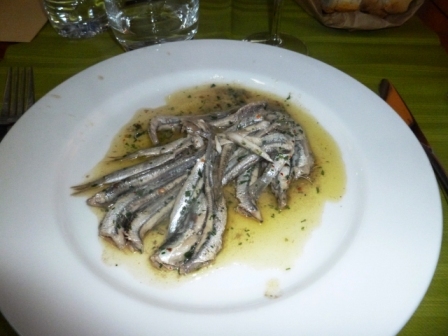 I also noticed a nice-looking restaurant on the harbour (next to where you take the boats to go to the Cinqueterre villages) which serves very reasonably priced fresh fish straight from the fishing boats which was packed with locals, so can probably recommend it. The waterfront and the “maritime garden” is also pretty pleasant to walk around. Plenty of guide books suggest to stay in La Spezia as it’s very easy to get to the Cinqueterre villages by train using the Cinqueterre pass and is also easily accessible from the motorway, more so than the villages of course but also Levanto, which is another frequently-used accommodation option. As I mentioned, La Spezia is also the transit point if you are going to Portovenere by any other means than by boat: take bus no. 11P from the bus stop near the waterfront, here are the timetables. Be careful, you need to buy tickets at the machine across the road, there is no way to buy them on the bus. 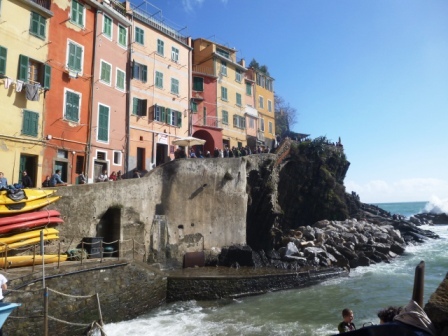 This touristy but charming seaside/jet-set resort located on a promontory separating La Spezia from Riomaggiore at the tip of the Golfo dei Poeti can almost be considered as the sixth village of the Cinqueterre. Located 13km from La Spezia (therefore a 30 minute bus ride), this pedestrianised medieval village, which was initially a Roman port before being fortified during the middle ages, has a small marina lined with waterfront restaurants, quite similar to Villefranche sur Mer on the French Riviera, so it’s worth spending a few hours and wandering around. The most interesting way to visit Portovenere is to walk up the hill via the main pedestrian street, Via Capellini, where the restaurants are better value for money than those on the waterfront, and wind your way up to the Castello Doria castle from which you will enjoy a fabulous view over the whole of the Golfo dei Poeti and the Isola Palmaria island opposite. Looking down from the castle, you’ll also see a rocky promontory with the 13th century gothic-style San Pietro church. 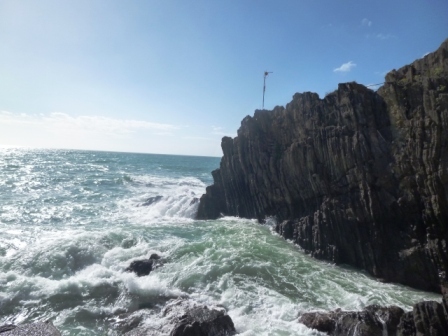 The beautiful view over the promontory is more reminiscent of Brittany or Cornwall than the Italian Riviera, with the waves crashing against the rocks and the small causeway linking the church to the mainland. 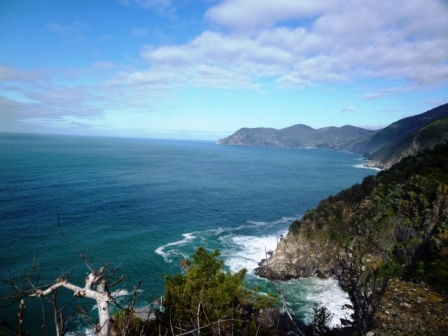 Once you are down at the church, admire the lovely view west over Punta Mesca and the Cinqueterre villages. If you have time to spare (which I didn’t during my visit), take the boat to the neighbouring Isola Palmaria during the high season – it’s only a 10-minute ride away – and have a wander around, enjoying the splendid natural beauty of the island. According to a friend of mine, the restaurant on the island is very good. 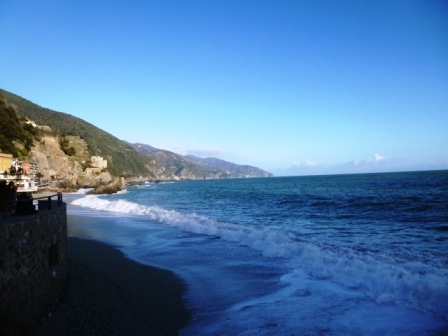 This pleasant town borders the opposite side of the Cinqueterre, and is therefore located to the west of Monterosso, on the opposite side of Punta Mesco. There are plenty of bars and restaurants and the medieval ruins are interesting enough to warrant a short trip if you have time to spare, as is the waterfront with a sandy surfing beach. Levanto is a great base to stay as transport from Levanto to the Cinqueterre is included in the train day pass (as is La Spezia) and there are plenty of reasonably-priced bed and breakfasts, but note that the railway station is a bit of a trek from the waterfront (around 15 minutes at a fast pace, so not ideal when you’ve spent the whole day hiking through the villages). Also, road access from the motorway is much more tedious than La Spezia, around 30 minutes round a windy road which can be frustrating if you are stuck behind a lorry or a caravan (I’m speaking from experience!). This was my base for my 2-night visit, a very good choice in the Fegina neighbourhood of Monterosso, so just 1 minute from the beach and 5 minutes from the railway station… Free parking, nice modern room with a balcony overlooking a very pleasant private garden, free wi-fi, good breakfast and friendly staff with a swimming pool in the summer, all for just 70€ per night – that was basically all I needed to be able to go around. The hotel also has a very reasonably-priced fixed menu dinner but I’d advise you to get out and enjoy the treats of Monterosso instead. 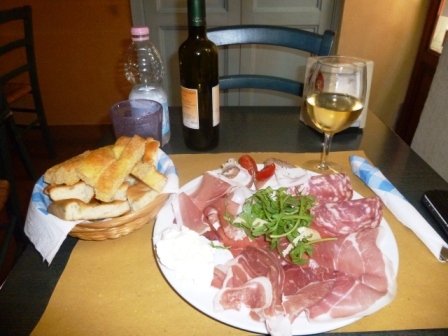 This small family-run trattoria with only a few tables was recommended to me during my aperitivo at Enoteca da Eliseo (see below) and is hugely popular with the locals. 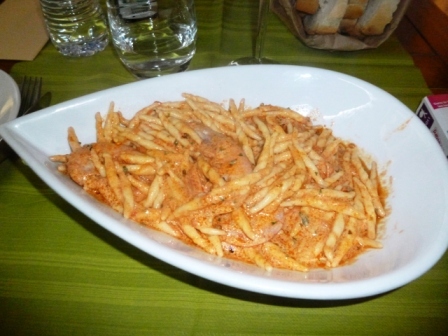 Local specialities I tasted included anchovies marinated in white wine and especially some amazing trofie pasta with gamberoni (prawns): probably the best tasting pasta sauce I’ve ever eaten! All this washed down with some delicious Cinqueterre white wine and some very friendly service, give this place priority if you’ve only got one day – it’s located in one of the small streets to the north of the Old Town, you’ll need to wander around a little bit to find it but Monterosso isn’t very big so it shouldn’t take too long! 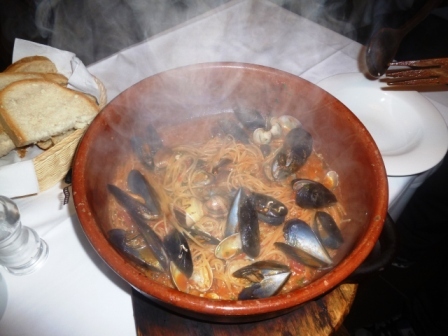 This traditional seafood restaurant is located on one of the main squares of Old Monterosso (so the eastern part of the town) and is especially famous for its delicious seafood spaghetti, cooked in a copper plate. That’s all I had, but it was divinely good. On the downside, the place isn’t the cheapest if you want several courses and it can get pretty touristy. 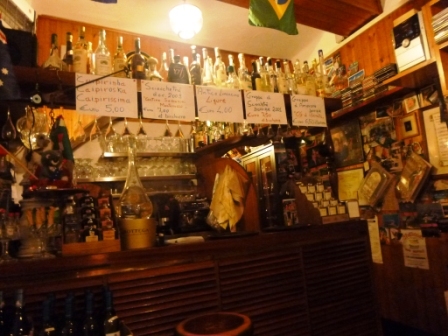 This small wine bar was one of my best finds of the weekend and I spent quite a bit of time just relaxing there on the comfy sofas, listening to some opera music and chatting with the friendly owner Eliseo and his Brazilian wife Anna. 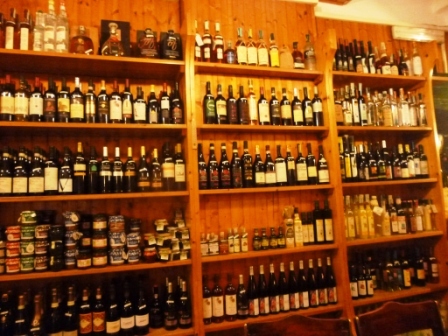 This wine bar is a true temple to the Italian gastronomic dolce vita with fine foods, wines and spirits all over the walls of the two small rooms. There’s a very wide range of good wines by the glass at reasonable prices (an excellent Brunello di Montalcino for 6€), cocktails, good single malt whiskies and grappa. 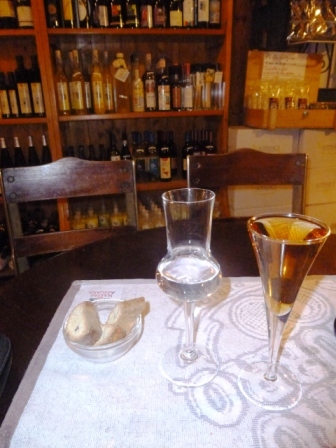 I tried out another local Cinqueterre tipple, sciachetrà, which is a very sweet and honey-like local fortified wine – expensive but worth tasting (once). It’s also nice to relax on the outdoor terrace during the summer months and just people-watch on the small square where the Enoteca is located. A nice combination of grappa and sciachetrà! Delicious lunch in Portovenere, with cheese, cold meats and Vermentino, just the refuelling I needed before attacking the rest of the Cinqueterre! 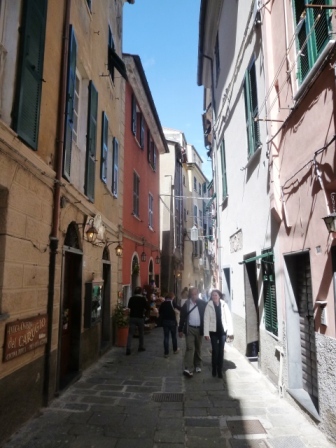 This charming little bar/restaurant on the main pedestrian street of Portovenere (running half way up the hill behind the waterfront) was an ideal pit-stop for lunch during a rather busy day trying to take in as many of the sights as possible. The warm focaccia served with cold meats and cheese, washed down with some delicious white Vermentino wine, was just what was required before visiting the rest of Portovenere. This entry was posted in The Italian side of the border, Travel experiences around the rest of the world and tagged accommodation, Azur, Côte d'Azur, cinqueterre, coast, coastline, corniglia, Cote, fish, french, french riviera, french riviera blog, frenchriviera, frenchrivierablog, holiday, italy, kevin hin, la spezia, leisure, liguria, manarola, monterosso, mountains, olive oil, portovenere, riomaggiore, riviera, sea, seaside, tourism, travel, vacation, vernazza, villages, wine. Bookmark the permalink. Hello Kevin! Very complete post! 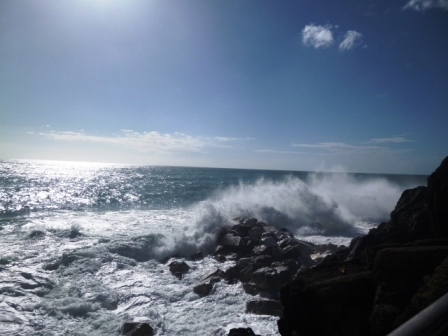 As you know , last Sunday I visited Cinqueterre, I just loved it! I have to come back and follow your advice, very good resto in Genoa by the way. Hasta otra, Inma. Don’t forget ‘Prevo’, hamlet of Vernazza, the highest and most impressive spot of Blue Path at 208 meter above sea level. Great article and very informative. 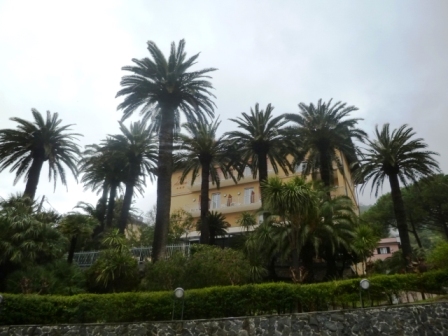 We also loved Rapallo (to the north) as a base for the Italian Riviera. 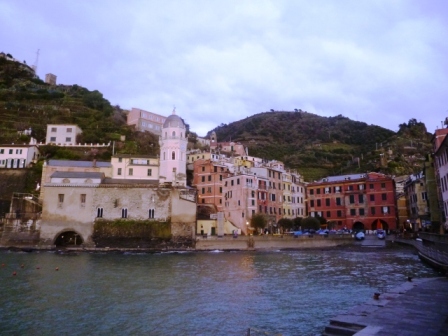 It is a handy transport hub for the Cinqueterre as well as the Portofino area and Camogli. It has a lovely promenade, beaches and a castle as a bonus. We stayed at the Hotel Vesuvio and highly recommend it. Ki ora from NZ! Can’t wait to discover the beauties of Cinqueterre and will make sure to note some of your great recommendations! Well written!